Whether you share a bathroom with your hubby or you happen to be the only girl in an apartment of boys, you likely want your facilities to cater to both sexes. By making gender-neutral design choices, along with implementing a certain piece of new technology, you can make the ideal unisex lavatory. If you're trying to make all bathroom-users happy, you may want to push down your impulse to be too extreme in color. Houzz.com shows how a bathroom with both bright and dark colors might bring opposing personal preferences together. Instead of tacking up a lacy pink shower curtain, tiling the shower blue brings a similar brightness into the room. Dark brown flooring balances this out tastefully, and a white wall adds contrast to the space. In terms of the bathroom's fixtures, choose pieces that have similar simplicity. 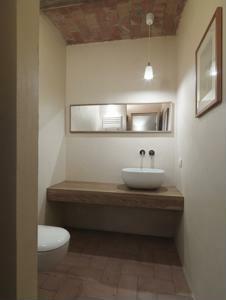 Houzz.com shows how a wooden vanity adds a natural, gender-neutral element to the room. Be mindful in your choice of bathroom accessories, as well. From the hand towels to the toilet paper holders, choose neutral colors and simple designs. If, once you've made your bathroom gender-neutral in design, you feel it still needs a little something extra, you can also implement a new, helpful device. The long-standing, often silent battle between bathroom users of opposite sexes is that of the toilet seat. According to WTOP, a new device from Tip Alert eliminates this issue through a simple alarm system. The peel and stick device attaches beneath the toilet seat. If a bathroom-mate starts walking away without putting that seat back down, a playback alert sounds to remind him to do so. Additionally, according to the product's website, the device contains an LED light that flashes every 15 seconds, warning people in the dark if the seat is up.. Putting this gadget in your bathroom may increase the harmony between sexes by reminding its users of restroom protocol. Other small additions may appease both male and female facility denizens. If you have a basket next to the toilet, try keeping it stocked with sports magazines, fashion literature and music rags. Put a big medicine cabinet in the room to hold his shaving cream as well as her perfume. These items, combined with neutral design, may make sharing a bathroom a little easier.